WE OFFER CAD CAM TRAINING IN PUNE AREA ONLY. CAD Learning for AutoCAD Mechanical offers training and tutorials covering the mechanical specific features and functions of the familiar AutoCAD software. 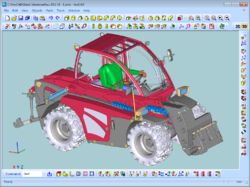 Lessons cover beginner, intermediate and advanced topics on 2D and 3D drawing and editing features of the software to design assemblies, document parts and more. We are providing CAD/CAE training on solid works. We have well experienced sttaf, who did worked in indutry as a designer. 1. Module wise schedule of training. 2. Every moudle is alloted sufficient training hour & pactice hour. 4. Practical exam at end of every module & course. 5. Demostration on live project. - Do the work on Mechanical 3D Modeling & design. - Apply this knowledge to understand the engineering design work flow process in the Manufacturing Industry. - Acquire knowledge of 3D design visualization. CMS Computer is Dassault Systèmes Authorized Training Partner. CMS Computer training center offers CATIA V5 course in Bangalore and also provides advance courses CAD 3D design software, 3D Digital Mock Up and Product Life cycle Management solutions(PLM) . SIMTEK is an Authorized Training & Support Center for SolidWorks & Mastercam software, having training wing in Chennai, Coimbatore & Kolhapur. Since 2000 SIMTEK has been involved in CAD/CAM/CAE Training for students & corporate. In module 2, we provide advance course to our students.It means we provide Industry based training to our students. Creating 3D jewellery products such as Rings, Pendants, Nosepins, Bracelets etc. The duration of this course is of two months.